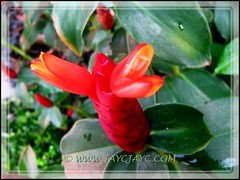 Our tropical garden is forever filled with delightful flowers to bring joy to our daily lives. The plants are always busy at work to reward us with colourful blooms to gladden our hearts. The red, orange and white flowers were the prominent ones for the months of June and July. Calliandra emarginata ‘Red’ or Red Dwarf Powder Puff, a tropical perennial shrub is one handsome plant that seems to be forever flowering. 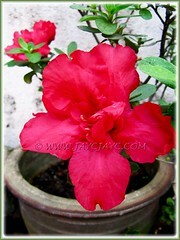 Though flowers are short-lived, lasting a day or two but their abundance and radiant red colour is sure to delight you. 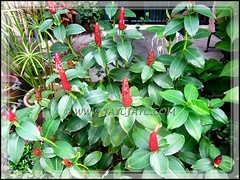 Costus woodsonii or Red Button Ginger was added to our garden last December. A small clump that was planted at our inner garden plot and it had grown into a rather large clump with endless and very lasting flowers to thrill us! Besides, a generous friend presented with two pots of these plants in January 2012 and they seemed very happy, blooming their heads off! Costus woodsonii looking luscious and elegant. Close-up of Costus woodsonii’s flowers. Rhododendron simsii or Azalea indica, our potted garden resident since early 2007, is also a very reliable and profuse bloomer that dazzle us almost year round! Another image of the potted plant, captured on July 27 2012. 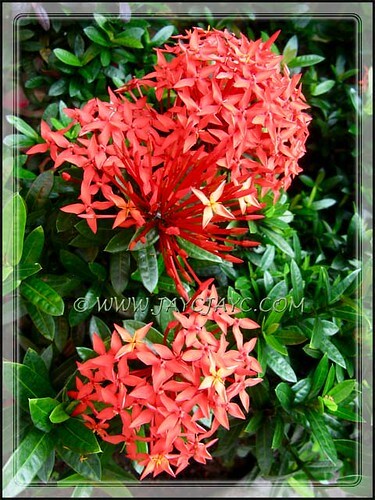 Ixora coccinea ‘Dwarf Red’ or Needle Flower, another favourite of ours that had been with us since mid 2008. 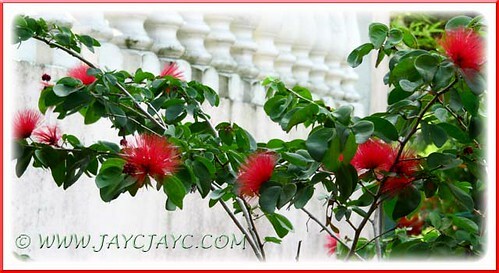 It flowers year round in our tropical climate. Anthurium andraeanum, a dwarf vibrant red variety was added to our courtyard garden recently to add colour and interest in that area. 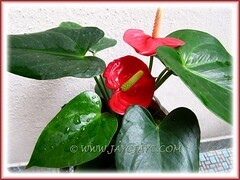 It was love at first sight with its bright Christmas colours of red and green and couldn’t resist bringing a pot home. Moreover, it had a promotion tag of RM8.00, a drop from RM12.00. 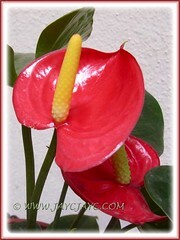 Flamingo Flower/Lily, Tail Flower, Lacquer Anthurium and Oilcloth Flower are some of its common names. Another image of the potted plant, captured on July 11 2012. How lovely, the flowers are still gorgeous to date. 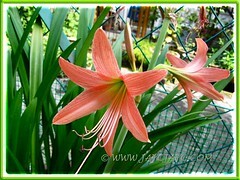 Salmon-orange coloured Hippeastrum at our backyard garden, June 20 2012. We’re delighted to observe that this is the first flowering after being repotted as it was pot-bound and we wanted to trash the excess bulbs. 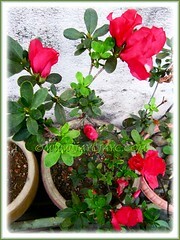 We’re truly blessed with such beauties in our garden, providing brightness to shaded areas. 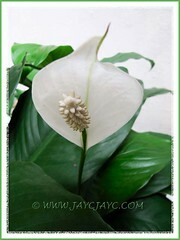 Spathiphyllum spp. ‘Mauna Loa Supreme’ (Peace Lily) is a reliable bloomer that flowers almost year round. Photo captured on July 22 2012. 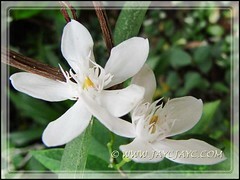 Wrightia antidysenterica (Snowflake) is another reliable bloomer that flowers almost year round in our garden. Photo captured on July 22 2012. Hymenocallis caribaea (Spider Lily) is one handsome bloomer that emit an intoxicating scent in the evenings till dawn. 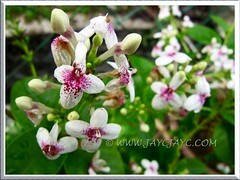 Simply marvelous to stroll in the garden in the evenings to enjoy its fragrance. Mussaenda philippica ‘Aurorae’, is gloriously beautiful when covered with bright off-white bracts. But when it eventually starts to wither and litters the bracts everywhere on the ground beneath, it’s so bothersome to remove all its rubbish. Definitely a litter-bug and a pity that we’d rid of it soon as it’s now considered high maintenance. Pseuderanthemum reticulatum (Golden Net-bush), a sun-loving flowering shrub that just love to cheer us with its sunny faces of white and magenta-purple spotted flowers. A wonderful year-round bloomer. 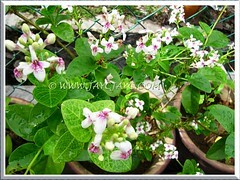 Another image of our potted Pseuderanthemum reticulatum (Golden Net-bush), taken July 11 2012. Hope the photos displayed will brighten your days too. Enjoy! Enjoyed seeing all your reds & white blooms in your garden. Great to know that, James. And thanks for dropping by and sharing our garden joy. 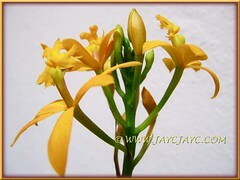 Hello, I am amazed and impressed with this blog with plants that we share in common. I Yaritza (Venezuela) and I have a small garden at home, our annual climate between 25 ° and 40 ° C.
I am fond of plants and just start me in knowledge about gardening. Please share this blogdening. Greetings. Greetings to you too and thanks for your thumbs up of our blog, Yara. Great to know that you grow some similar plants in your neck of the woods. All the best in your gardening. Thank you, I was inspired to create a blog of mine. Awaiting your visit and comment. I’ve just visited your blog, Yara! It’s lovely and I’ve enjoyed the images that you’ve included in your articles. Your garden looks like a resort now! 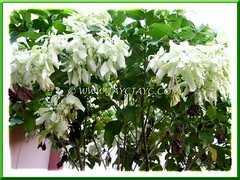 I love the white mussaenda and the salmon hippy lily is the one I am trying in vain to grow. 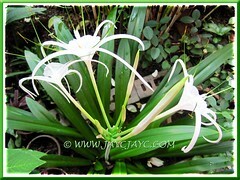 It is a common hippy lily here in Malaysia but it is not growing well in my garden. Hehe, you’re too generous with your comment, A. Belle. Nonetheless, it made my day. :-) Thanks and have a lovely Sunday and a great week ahead.